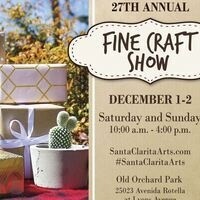 Join us for a FREE, outdoor event featuring unique gifts and a shopping experience unlike any other! With over 50 artists' booths showcasing high-quality, original arts and crafts, you are sure to find the perfect gift. Delicious food trucks and live music will kick off the holiday season. It’s just gets better every year. Great gift for the Holidays. I walked away with a lot of gifts for family and friends. Most crafts are reasonably prices.